*The Disneyland ticket is only available with the Disney Combo package, or alternatively, upgrade to include Disney ticket by paying HKD 477.00/Adult and HKD 406.00/Child at Online Being Seng Counter at the Hong Kong Airport. Collection Information Please collect your tickets / pay the supplement at: Online Beng Seng Company Ltd. Counter A13, Level 5, Meeters and Greeters Hall, Hong Kong International Airport, Lantau Island. Open Daily 9am-11pm. 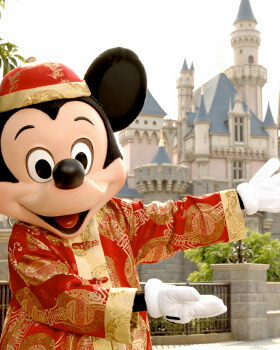 Enjoy a fantastic day out with your family and all your favourite Disney characters at Disneyland Hong Kong! A must-see for Disney fans, young and old, Disneyland Hong Kong is one of the city’s top attractions, and it offers a unique take on the Disney experience that’s inspired solely by Chinese culture. Hurry down to meet some of your favourite characters, who’ll meet you with open arms, and show you around all Disneyland Hong Kong! The Disneyland experience starts even before you get to the big gates! It’s easily reachable via the MTR and Mickey’s ears are painted on all the directions in the station and on the trains - cute! Everyone visits Disneyland with different types of rides in mind, but if you’re after the rides with the biggest drops, you may want to head over to the Grizzly, Hyperspace Mountain RC Racer and Iron Man rides. These are Disneyland Hong Kong’s ultimate rides, so be warned, you might want to pack your best screaming voice! Hyperspace Mountain is definitely one of the scariest rides and is one to look out for if you or any of your companions are Star Wars fans, as it plays homage to the Star Wars theme in a particularly impressive way - no spoilers. The opening and closing parades are one of the most enjoyable features, offering the full Disneyland experience, so make sure you can catch one if you’re there in the morning or evening. You’ll see brilliantly coloured floats, dancers and all the Disney characters, creating a real carnival-like flavour. The availability of delicious Chinese and Asian food is also a lure for many visitors and Disney fans. Plaza Inn, the first Chinese restaurant in Main Street, is complete with 19th Century Chinese table service. With the image of cartoon heroine Mulan everywhere, you come to the conclusion that Mulan is really at home now. Market House Bakery and Main Street Corner Cafe are also good places for you to enjoy. Lingering in Emporium and Main Street Mercantile, having a look in The Curiosity Shop and Silhouette Shop, you will surely find timeless treasures. While Disneyland Hong Kong is fantastic in every weather, it is worth checking what the weather is doing on the day of your visit so you can plan ahead for being outdoors. Sunscreen is a must, but as Hong Kong is prone to typhoons, this means that some rides may close during the rain as a matter of precaution. Just one to bear in mind. It’s also worth downloading the Disneyland Hong Kong app as it shows the wait time for each ride, which helps when it comes to day planning. While there’s plenty of cafes, it’s advisable to bring bottles of water with you so you can avoid going into cafes too frequently and stay hydrated while in the queue for rides.